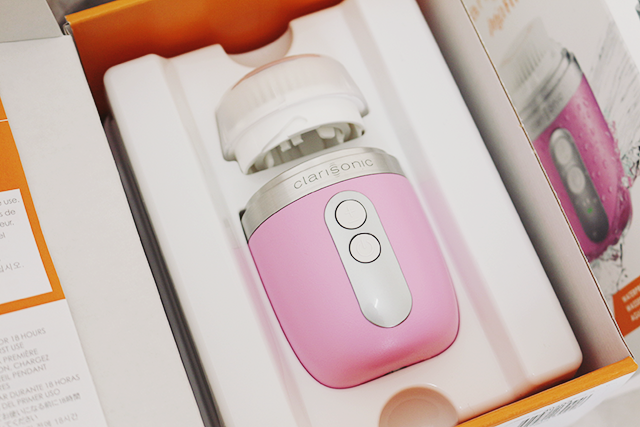 I'm setteping my skincare game by including some cool device that I have been eyeing on for such a long time. 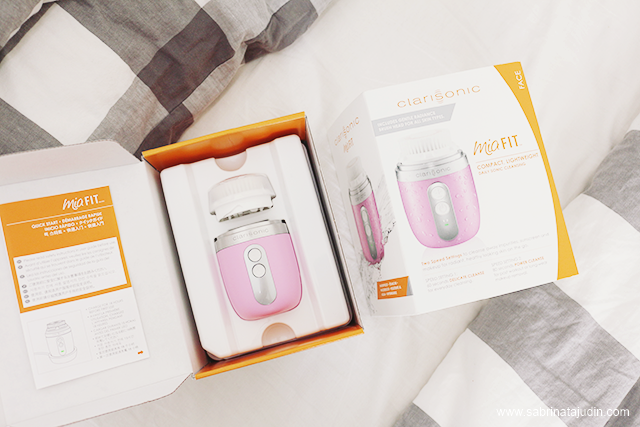 After many generations of Clarisonic, finally I made my decision to try the latest one which is the Mia Fit that I got from Hermo Malaysia. So first I am going to give you my first impression when I first got the box with me. It comes in a orange white box, as you open it, the device is securly placed in the box for full protection. There were lots of manual and brochure in there that I have not yet read through. But basically the important part that read through is how to charge this things and how to place it together. 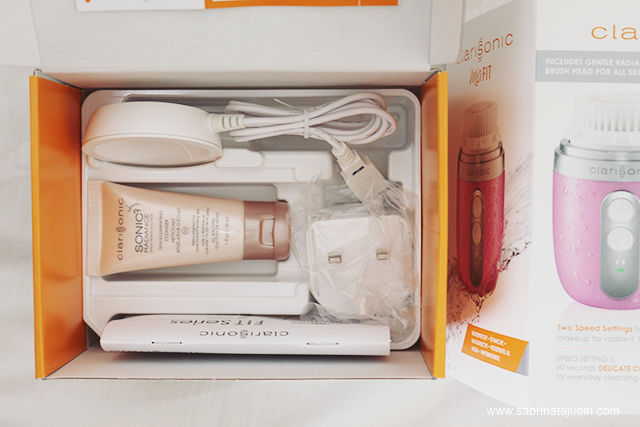 On the bottom layer contains all of the charger and also it comes with a Skin Illuminating Cleanser (1.0 oz.) that I also tested within the week for this review. 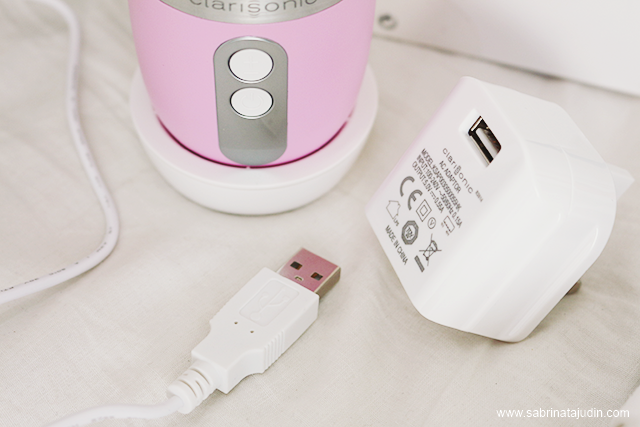 I love the USB Enabled Universal Voltage Charger, where you just need to place the Mia Fit on it and it will charge. You wont able to see how the baterry looks like as what I thought it is built inside the devide to prevent water from reaching through it. So yes this device can be use in the shower and it is 100% waterproof. Perfect! During the first day I got, I charge this devide for 12 hours. I place the charge under my bed and it is really easy to use and reach whenever I needed it. 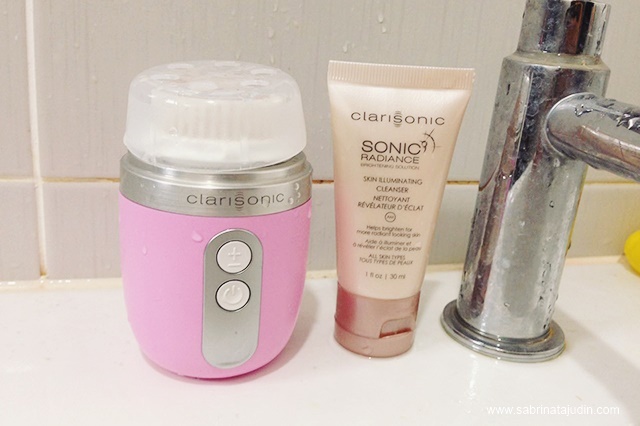 This Clarisonic Mia Fit helpsto remove impurities, sunscreen and make up 6x better than your hands alone. 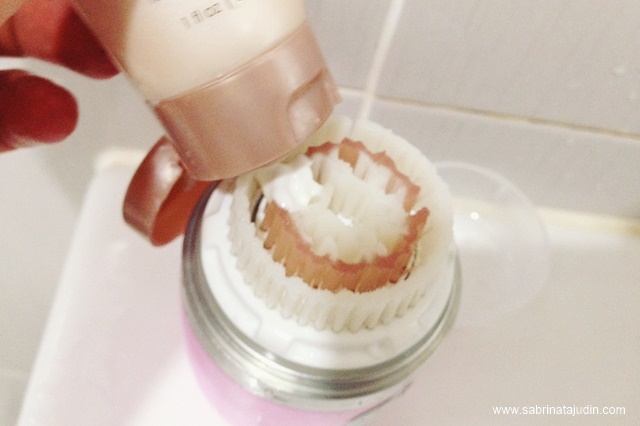 I just put my Mia Fit in my bathroom, I use it during my evening cleansing routine. To my surprise, since the first day I charge it,until now, the baterry is still remains! I use their travel cleanser that comes in the box. It is the Sonic Radiance Cleanser. Usually I will remove the cap and rinse the britstle with tap water. The brush head is the Radiance brush head. The britsels are made very soft to the touch. 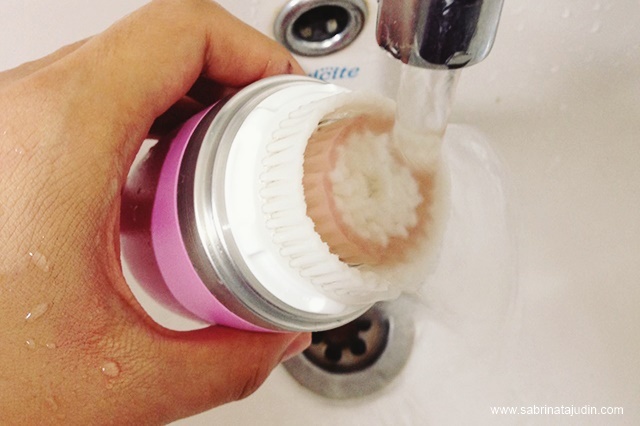 The bristles are made from non-porous material that will not harbor acne-causing bacteria with regular use. Non-porous material means that it cannot absorb liquid or gas. So it does not take away your cleanser white it is on it. After that I put on the cleanser o top of it and turn it on. Click twice to increase the speed. Comes in 2 speed, 1 & 2. I never tried speed 2, i find that it is too harsh on my skin. The light number will indicate on the bottom part for you to see. 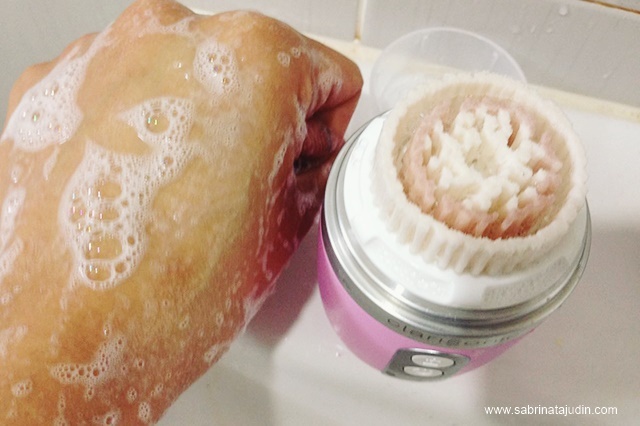 Here I demonstarte on how it foam up the cleanser when in touch with my skin. I also put some makeup on my hand on this demonstration to show you that it also helps take away all of the impurities in the skin. As you can see there is a bit of a dirt on it. 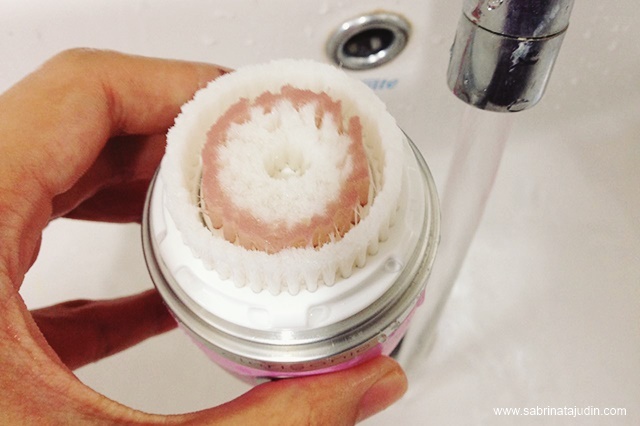 Simply rinse it with water and it removes completely. The head can be replace after it is worn out or after 3 months. My verdict. On the 1st week of usgae I do find that it dries out my skin. But with aproper skincare routine and good mousturizer, it helps to keep my skin hydrated. 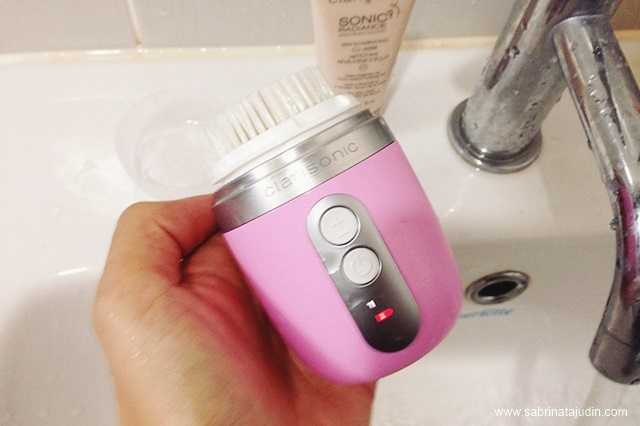 This device has help me feel so much "cleaner" and I felt that my skincare absorb much more better with this proper cleansing method. I recommend you to use it during night time. 3 times a week if ou feel it is too hard on your skin. I use it daily and I find that it works best on me like that. Will continue to use it with other cleanser and see more differencede with this, as I find the cleanser it comes with does not really "wow" me. This device also comes with a two year manufacturer's warranty. 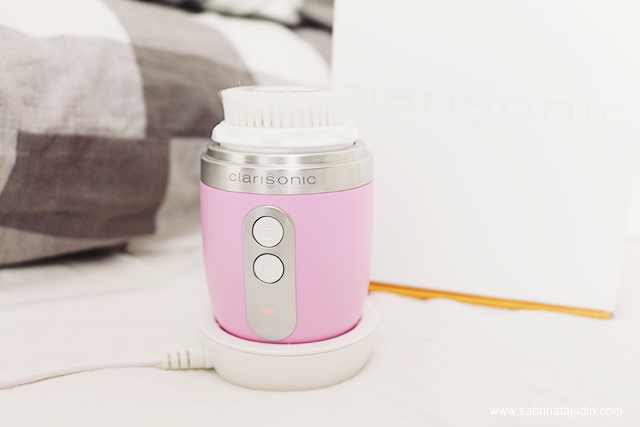 This Clarisonic Mia Fit retails for RM792.00 at Hermo Malaysia.